When it comes to footwear for hiking, many people might automatically think about hiking boots. They are the best choice in term of providing warmth and cushioning for your feet when you walk on hard and tough terrain. Still, some of the hiking boots would be quite hot for a hiking trip in the summer. That is when a pair of hiking sandals might in handy. 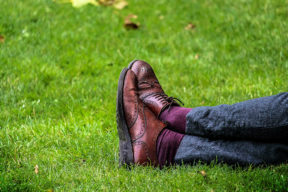 In fact, people use hiking sandals more often than you might think. They prefer wearing a pair of hiking sandals to give their feet a little bit of cool air during warm weather. In addition, a pair of hiking sandal would be useful in case it rains. Also when you go hiking in well worn trails, lightweight hiking sandals are always better than heavy boots. If the above reason are enough to persuade you to buy a pair of hiking sandals for your next trip, scroll down to read more about the best hiking sandals available to you at the moment. 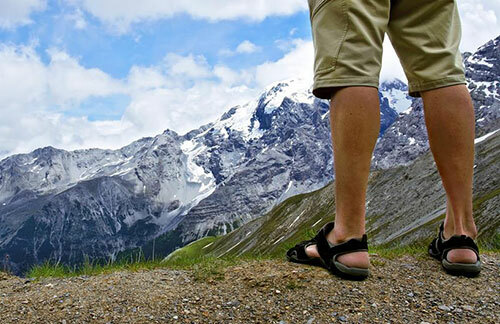 Choosing a pair of men’s hiking sandals for your next hiking trip is never an easy task. There are thousands of models for you to choose from on the market. It is important to pay attention to the process of choosing a pair of hiking sandals. In fact, a pair of hiking sandals is not only capable of enhancing your style, it also needs to protect your feet, provide cushioning for them and make you feel comfortable while walking for a long time. This is possibly one of the most important things that you should look for in a high quality pair of hiking sandals. Make sure that the design of the sandals support arch and provide a lot of comfort and protection for your feet. Also check for the cushioning of each hiking sandal. It should be thick enough to enhance the comfort you have while you walk on various types of terrains. There are 2 types of designs in term of the toe part, which are the open toed design and closed toe design. The closed toed design will help to protect more parts of your toes. However, it will be less well ventilated than the open toe design. This type of hiking sandals is suitable if your hiking trails have a lot of rocks and sharp object. On the other hand, a open toe sandal is more well ventilated but it doesn’t cover your toes, let it prone to the sharp objects such as rocks to injury your foot. Therefore, you should only wear this type of sandal when you go hiking by the beach or on paved roads. 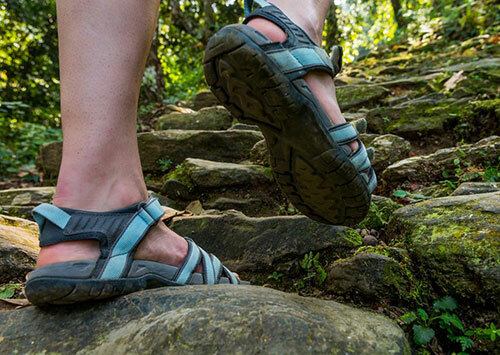 The sturdiness of the treads which are used to make a hiking sandal is very important. It will ensure a sandal can last longer and survive many season of hiking trips. The Vibram sole is also a useful feature that you should consider when choosing a pair of hiking sandals. This feature brings a very good traction, allowing you to walk on wet conditions and wet surfaces without any difficulty at all. Finally, make sure you pick up the right fit. When you find a pair of hiking sandals that meets all of your needs, you should wear it on and walk a few steps to see if you feel comfortable walking on these sandals. When you are able to find a pair of hiking sandals that meets all of your needs and preferences, knowing it is very important for you to know when you wear this pair of sandals. You should never wear when you carry a lot of stuff on a heavy backpack. In case you wear a pair of hiking sandals and carry heavy loads, you will see that there is a huge amount of pressure which is put on your joints, causing damage to your feet. Also with its nature in design, a pair of hiking sandals will never be able to keep your feet cool. Hence, the best occasion for you to wear a pair of hiking sandals is when you go hiking in a warm and mild climate or on a soft surface. You can also wear a pair of these sandals with a light day backpack. Its Main Features: This hiking sandal is made of textile material with synthetic sole. The heel measures approximately 1.5 inches. It is a classic sport sandal featuring nylon strap and lugged outsole. There are 22 options of colors for you to choose from including yellow, grey, and blue, black and white. This pair of hiking sandals comes with opening strapping system which is so breathable and well ventilated to keep your feet cool and comfortable in the hot summer night. The microbe shield lining is washable and have a quick drying performance so that you can walk in this sandal in the light rain without any difficulty. There is polyester jacquard webbing upper wraps around the foot and through the midsole for customized and perfect fit. The outsole is made with rugged material so be extremely durable with great traction for you to walk on many types of surfaces including wet and dry ones. This type of sandal comes in a wide range of colors for you to choose from. So whichever your preference color is, you can find it here. Not to mention that the design of this sandal is stylish and slim, not so bulky like other hiking sandals you can find on the market. This sandal might not as protective as other hiking sandals with its open toed design and a slim fit cushioning. 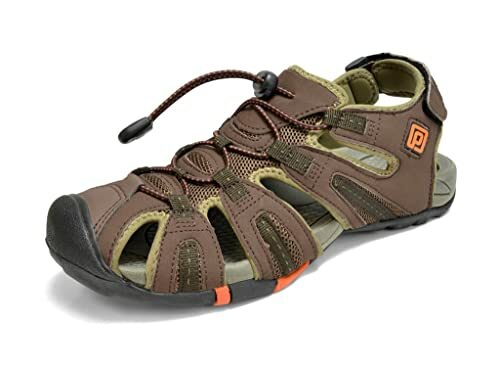 Verdict: In case you are looking for a trendy and stylish hiking sandal for a light duty trails, this hiking sandal is worth considering. Its Main Features: This hiking sandal features the open toe design. It has Vibram outsoles, Bio centric foot bed as well as polyurethane midsole and adjustable polyester strapping system. The heel meal measures approximately 1.5 inches. There are 22 different colors for you to choose from including insignia blue, pueblo brown and green. This sandal has a great arch support and pro-nation control. In addition, with the contoured drop-in EVA footbed, this sandal helps t cradle and support your foot while you have to walk on it all day long. Not to mention that this EVA midsole is compression molded to be super lightweight and super cushioning with high energy return so that you have no difficulty in lifting this sandal up. It features rugged rubber outsole is super durable that can last for several hunting seasons. In addition, this sandal comes with closed loop elastic cord lace and adjustable hook. This hook makes it easy for you to wear the sandal on and off your feet. In addition, you can have a more secure fit thanks to the flexibility of the hook. It has a great traction, allowing you to walk easily on slippery surface. The biggest problem of these men’s hiking sandals is that it doesn’t provide much protection for your toes. Verdict: This is one of the best open toe hiking sandals with unique design and affordable price for you to choose from. Its Main Features: The material of this sandal is polyester with rubber outsole. The heel measure approximately 1.5 inch. 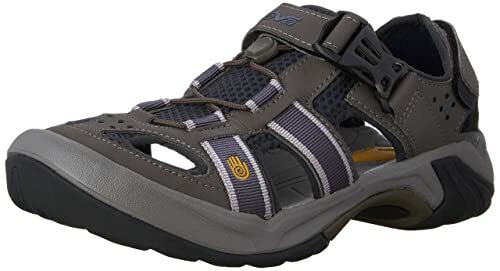 This type of hiking sandals men’s is available in a wide range of colors from midnight navy and grey to black and classic blue. The material of this sandal is the high quality polyester fabric which is washable and has a quick drying performance. The rubber outsole is made with non marking rubber with razor siping sole allowing you to walk on many types of surfaces without any difficulty or leaving any dirty mark behind. In addition, this sandal comes with metatomical EVA footbed to provide you with a sufficient amount of cushioning for you to walk on all types of surfaces on your hiking trip without feeling any discomfort. It has the multi directional lug pattern which helps to increase traction and help you walk on both wet and dry surface. The lace capture system is secure and will ensure you have the most perfect and comfortable fit. Last but not least, this sandal is made with cleansport NXT material for natural odor control and breathability. This sandal is a little bit heavier than other types of sandals that you can find on the market. Verdict: In case you are looking for a pair of hiking sandals with a well rounded protection for heavy duty trails, take a look at this one. Its Main Features: This pair of hiking sandals is made with synthetic and mesh material with rubber sole. It features a closed toe design with bungee lacing system, quick release buckle and adjustable hook and loop heel strap. There are several colors for you to choose from including ombre blue, brown and dark coffee. One of the most significant parts of this sandal is its encapsulated shock absorbing ShocPad heel which allows you to walk easily without feeling tired even if you have to walk for a long time. In addition, it comes with great traction and high energy return, allowing you to walk on all type of terrains easily. The non marking outsole ensures that you will not leave any dirty mark behind. The synthetic material with mesh lining has a quick drying performance. Although it comes with closed toe design, this sandal is breathable and well ventilated thanks to its high quality mesh material. It also effectively prevents odor from developing thanks to the anti-microbial protection. It comes with 3 points of adjustability for your enhanced fit and control, not to mention that it is easy to use the quick release buckle for wearing the sandal on and off. It is a little bit narrow in comparison with other types of hiking sandals on the market. The back of the sandal might rub against the ankle, especially when the sandal is a little bit tight for you to wear. 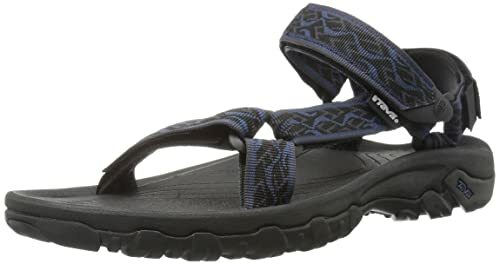 Verdict: In case you are looking for a pair of sandal which is part sandal, part shoe hybrid with a good protection, take a look at this high quality sandal from Teva. 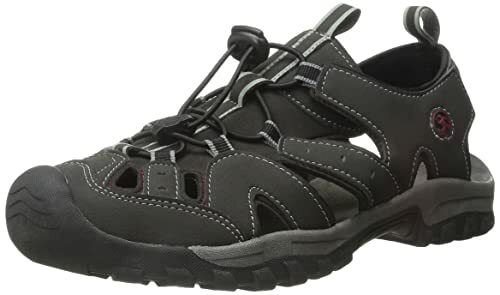 Its Main Features: Here comes another pair of high quality mens hiking sandals from Keen. This sandal is made with leather and synthetic material with rubber sole. The heel measures approximately 2 inches. 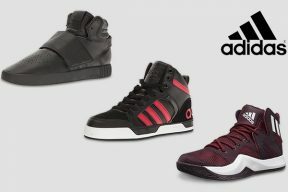 It features the sport sandal style with bungee lacing system and rear pull on loop. There are 2 colors for you to choose from including black and brown. This sandal comes with a removable metatomical dual-density EVA footbed for your highest level of comfort while you walk on all kinds of terrains on your hiking trails. The open vents on the sides of the sandal are made with high quality leather to be very well ventilated and breathable. Not to mention that it is lightweight, durable and waterproof as well. The multi-directional lug outsole helps you to walk on both wet and dry surfaces without any difficulty. The construction of this sandal is very solid and well made with tough stitching lines which help the sandal to last for several hiking seasons. Your foot is well supported from this sandal with enough arch and heel support. 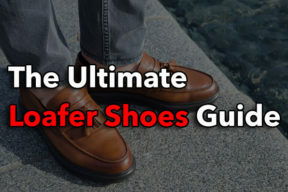 In addition, it protects your toes and your ankle well. 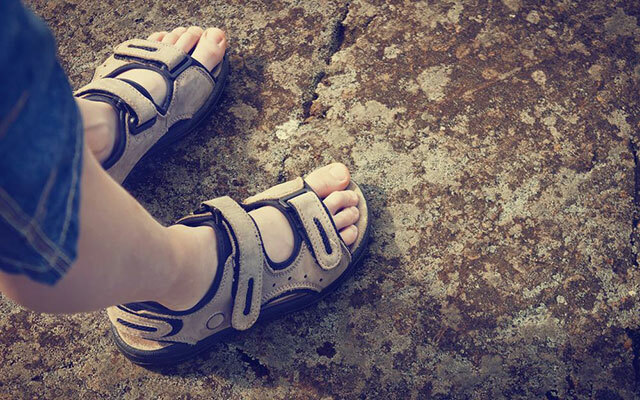 Since part of the sandal is made of leather, you need to care for it more than other pairs of hiking sandals in order for it to be dirt free and last as long as possible. You should use a leather cleaner and conditioner for this pair as well. It runs a little bit bigger than other hiking sandals of the same size that you have here on this list. 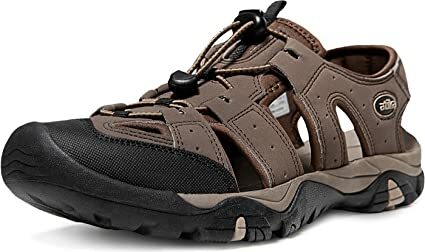 Verdict: In case you are looking for a premium sandal with premium material, super comfort and great protection to wear when you go hiking in the fall or spring, this one is worth considering. Its Main Features: This hiking sandal is made of synthetic material with synthetic sole. The heel of the sandal measure approximately 1.25 inch, which is of the same height as the platform. It features a closed toe design with bungee cord lacing and toggle closure. There are 5 colors for you to choose from including black, charcoal and dark brown. With closed toe design and protective rubber toe guard, your foot is protected from any potential hazard on your walking trails. 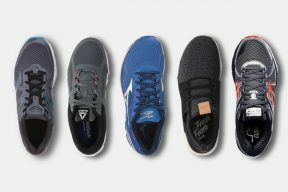 It comes with a contoured EVA midsole with textured surface that provides a lot of support and cushioning for you when you walk on hard and tough surface. The material of this sandal is of high quality with a quick drying performance. In addition, it is capable of resisting water pretty well, making it suitable for you to use under the light rain. With the open construction and breathable material, this sandal is capable of ventilating air and prevent odor from developing inside your sandal. This sandal is extremely slim fit in design and light in weight, allowing you to wear it all day long without feeling any burden under your feet. This sandal is not as durable as other tough hiking sandals. 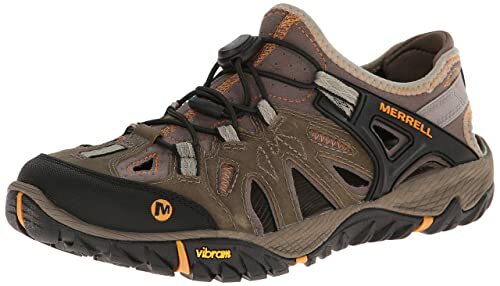 Verdict: In case you are looking for a pair of the best men’s hiking sandals with affordable price for light and medium duty trails, this sandal is for you. Its Main Features: The toe cap of this sandal is made of PU material while the inner layer is made of synthetic fabric and the outer guard is made of rubber. There are 11 options of colors for you to choose from including brown, blue and black. You can easily find hiking sandals on the market with single molded outsole and that is not enough to support you and make your feet feel comfortable. On the other hand, this hiking sandal is made with 3 layers in the front toe to bring you the highest level of protection against potential hazards on your way. Most significantly, the front toe is made with mid hybrid toecap, inner layer and outer rubber guard of high quality materials to make sure the hiking sandal can handle heavy duty very well. Not to mention that the synthetic material has a quick drying performance, allowing you to walk freely under the light rain or when you take part in various water activities. Last but not least, it comes with multi directional lug pattern in the traction so that you can have very sturdy and firm walk on both wet and dry surfaces. This pair of hiking sandals runs a little bit larger in comparison with other hiking sandals that you can find on the market. There is a little bit arch support. Verdict: This hiking sandal is for both light and heavy duty trails and long walks. It is suitable to wear when it is raining as well. Its Main Features: This is one of the men’s hiking sandals which are made from synthetic material in the upper part and rubber for the outsole. The height of the heel is approximately 1 inch. It features a classic style of fisherman sandal with stitching vamp. You can choose from 4 options of colors including brown, black, light yellow and grey. This hiking sandal comes with a very durable and high quality outsole which will last for many seasons of your hiking trips. The footbed of the sandal is made with EVA cushioning which is super soft and well cushioned. Overall, with the high quality material, this hiking sandal is lightweight, flexible and hence, comfortable for you to walk on it all day long, even in tough terrains. The Velcro strap of this hiking sandal is adjustable so that you can easily take the sandal on and off. And not to mention that it is very flexible, allowing you to adjust it to the size that you are most comfortable in. There are quite a few choices of bright and dark colors for you to choose from. With the stylish design, this hiking sandal doesn’t look bulky and ugly at all. The pull tab is attached to the sandal by glue, which can easily come off. Verdict: In case you are looking for a pair of fisherman sandal with classic style to walk on various types of tough surfaces, this one is one of your best choices. 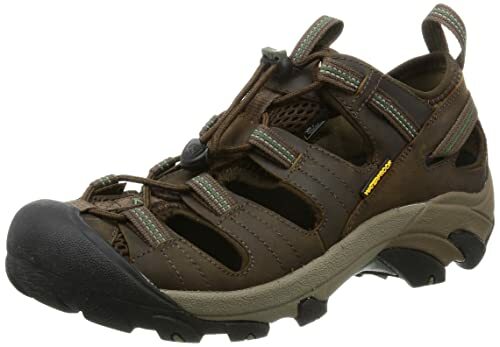 Its Main Features: This pair of hiking sandals mens is made of leather with synthetic sole. It features a closed toe design. There are 7 colors for you to choose from including brindle, black, grey and olive. This pair of sandals comes in a wide range of size for you to choose from- from size 6 to size 15. It is made with high quality waxy waterproof leather fabric to be very lightweight and durable. Not to mention that this material is enough to keep you cool in the summer and warm in the spring and autumn. In addition, the sandal is flexible and quite stretchy so that you can feel comfortable wearing the sandal on and off. This sandal is made with fresh antimicrobial agents to help reduce shoe odor and keep your foot cool all day long, even when it is hot outside. The construction of this sandal is well made with solid and sturdy parts to make sure it will last for several seasons of your hiking trips. It is well cushioned with high quality and thick footbed. You also have a lot of arch support and high energy return with this sandal. It doesn’t have a sole with good traction. You have to be careful when you walk on slippery surface with this pair of sandal. Verdict: In case you are looking for a pair of sandals with both speed and hiking performance. Also if you have a big feet and often find it difficult to look for a sandal that fits, take a look at this sandal. Here is the list of some of the best hiking sandal on the market. After all, a hiking sandal would be supportive and comfortable as long as you are able to find for yourself a high quality one. I hope with all of the tips that you need to pay attention to when choosing a hiking sandal and the review of the best ones on the market, you will quickly find one that meets all of your needs and preferences. With careful consideration and knowledge, I am sure that you would be able to make a very smart choice of which hiking sandal to buy.